For all who love different patterns and still being free and that make all the difference in your decoration, you are in the right place. 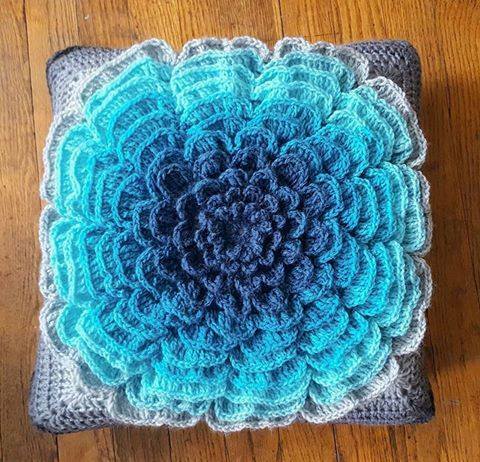 In those who love crochet we always love different patterns besides blankets, rugs and shawls, we love pieces that enchant and that make all the difference in our environment. I'm sure you will love the details of this pattern and also serve as an idea for other patterns you make and you want to add that in the center to modify and impress everyone. It is always good to be learning more and more things from the craft to the crochet. learning different techniques and techniques as well as learning new patterns so you can improve your hand skills and get new parts and work done. We always include free patterns here on our site and some other patterns with lovely videos or graphics for you to learn. Scroll through our website and see our incredible patterns available here and with many ideas and choose your favorites. The pattern of today that I come to share with you is the image above the cushion shown which is the pattern most popularly known as Neverending Wildflower. I'm sure you will also love this marvelous version that is perfect to add to a blanket. 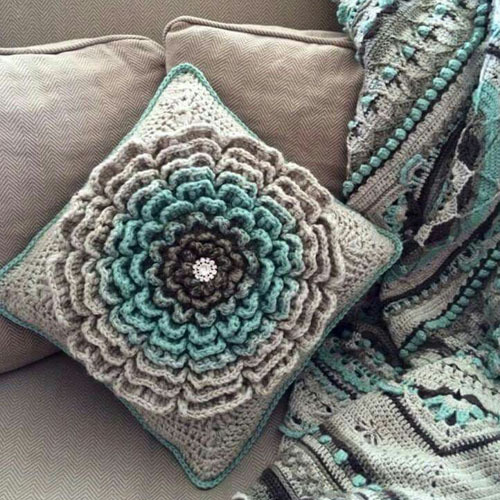 One can invent something with this crochet as a beautiful crochet pillowcase to cover your round or rectangular pillow, the rounds of 14 "look beautiful the finished work.This is the round version of the above picture of original flower of this pattern. take advantage of the old cushions you have or even the plain simple cushions that we buy and make covers to leave new and change the look of your living room or bedroom. Being also a great option to give a gift to someone dear, birthday or Christmas, I'm sure they will like it. To make this cushion cover can be of two types, being used permanent or be used as a removable cover that we can put a zipper or buttons, whichever one of your choice is your choice! The crochet flower is in front of the cape and is sewn into the back. This week I even found pillows that I did not wear because I was sick of the print, so I came up with this idea and I'm going to immediately make this pattern and turn it into a wonderful red pillow for my armchair. You can change the size as you just want to go increasing or decreasing the chains, and of course do not forget that the wire stretches easily getting more after you fill it. They liked the idea, I hope I have helped. Crochet can be used anytime and anywhere you want to make sure you look stylish. Below you will find the step-by-step pattern and all the information you need. Enjoy our page on facebook Xell Crafts and know all our news.